BÜNTING -Cosmographia Universalis. . .
BÜNTING, H. - Cosmographia Universalis. . .
Cosmographia Universalis. 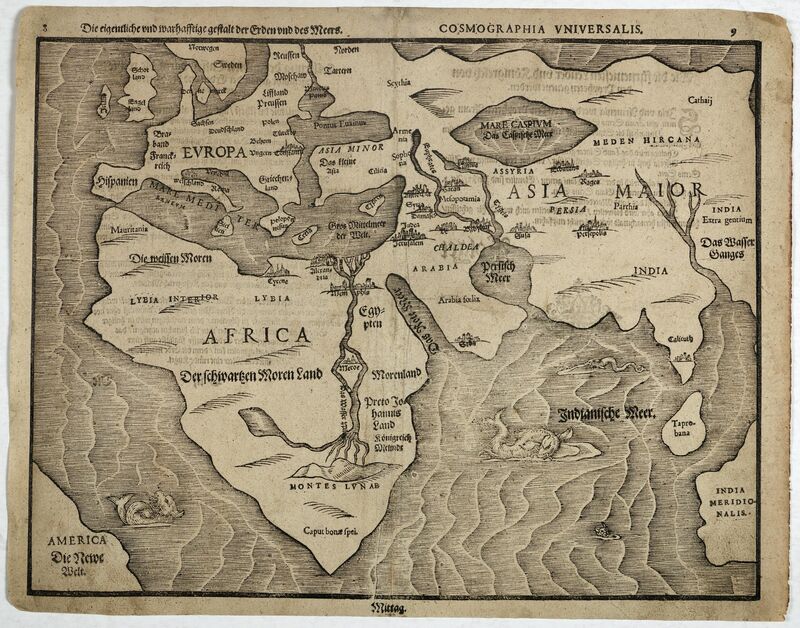 . . - BÜNTING, H.
Description :Map of the old world showing a landmass remarkably like the west coast of Australia and roughly where Australia should be.Lower left an early representation of America, the Caspian Sea is greatly exaggerated in size. The seas are adorned with sea monsters and many major cities are indicated and named. There are several states, of this map: this one with "Mare Mediteraneum" in the Mediterranean Sea and with "Taprobana"-Island at the bottom right hand corner. The map was illustrated in Itinerarium Sacrae Scriptura and was essentially a theological commentary with other maps of great curiosity. German text on verso. Condition : Wood block print. Paper slightly browned and spotted. Generally in good condition.